New with natural green tea extract. 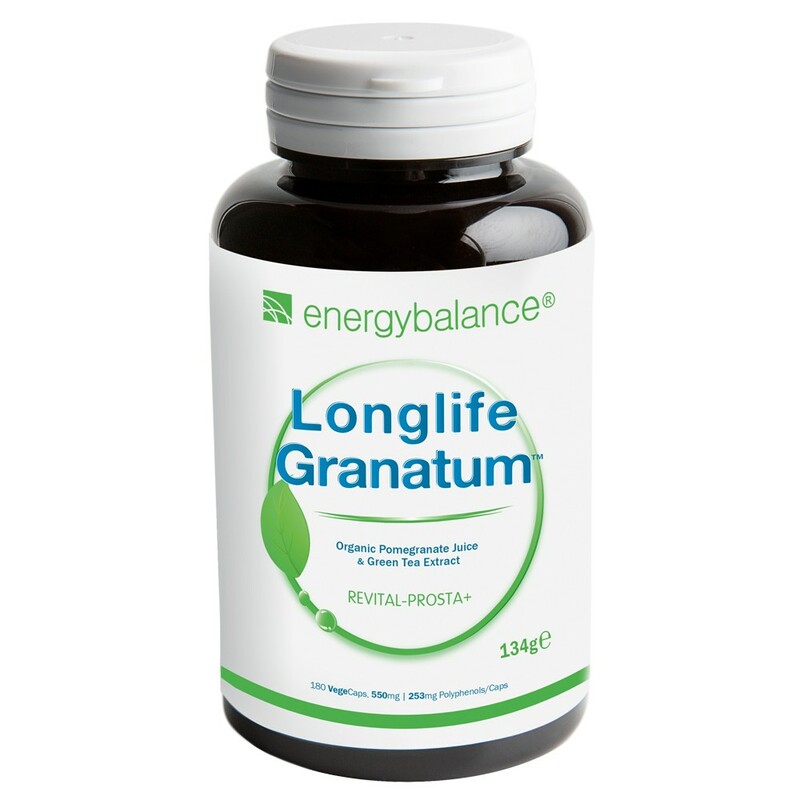 Longlife Granatum™ is made from organic pomegranate juice extract and highly-concentrated pomegranate extracts currently available. Pomegranates and green tea contain the important ingredient antioxidant polyphenols, also referred to as phytochemicals. These special phytochemicals give pomegranates their unique aroma and effect. One 550mg capsule contains 253g of polyphenol. Contents:180 vegecaps of 550mg each. One package lasts for at least 40 days. The pomegranate is also referred to as "punica granatum" in Latin. It is one of the oldest fruits eaten and used by people for medicinal purposes. Research on the pomegranate really began around seven years ago. Since then more than 200 papers have been published. Pomegranate juice has been proven to have conclusive antioxidant effects in clinical studies in vitro and in vivo. The latest research indicates that pomegranate polyphenols can also be used to prevent a number of common health problems. Ellagic acid is a polyphenol. Tests conducted at Hollings Cancer Center in South Carolina (MUSC) show that ellagic acid, which is a naturally occurring phytochemical, has a highly protective effect. Dr. Daniel Nixon (MUSC) began researching ellagic acid in 1993. Ellagic acid is a naturally occurring polyphenol that can be found in high concentrations in certain types of fruits and nuts and particularly in pomegranates. A study conducted by the Technion Institute in Haifa, Israel, found that eating pomegranates improves health. The research team, Prof. Jitzchak Neeman from the Faculty for Biotechnology and Food Engineering at the Technion Institute and Schai Schubert studied pomegranate wine and fresh pomegranate juice. Pomegranate juice is an effective antioxidant. Additional studies recommend drinking fresh pomegranate juice to prevent oxidation. Pomegranate juice contains a variety of natural nutrients such as vitamins, minerals and flavanoid. Even the ancient Egyptians and other peoples living in the Middle East valued the pomegranate for its effectiveness against intestinal parasites. There's a reason why pomegranate juice is sold as a health drink. More than 100 clinical studies worldwide have proven the antioxidant power of green tea. The tea leaves contain catechin, whose most important components are epicatechin, epicatechin gallate, epigallocatechin and epigallocatechin gallate. Catechin is responsible for most of green tea's effects. The polyphenols (particularly epigallocatechin gallate) naturally contained in some kinds of tea are responsible for the preventative effect. Since 2011, the German Cancer Aid foundation has been sponsoring a long-term study at the University of Halle (Saale) and Ulm University on treating intestinal cancer, donating a total of EUR 2.1 million. 180 capsules of 550mg each.